FOR TWO LITTLE MUNCHKINS – STELLA AND LIBBY. SHARED GIRLS ROOM = A ROOM TO GROW UP IN. The BEDS ARE ACTUALLY BUNK BEDS! I LOVE DECORATING KIDS ROOMS . THE POSSIBILITIES ARE VAST AND ENDLESS AND I LOVE GIVING A CHILD A FUN ROOM TO GROW UP IN!!!! Over the years, decorating kids rooms and especially my own children’s rooms…I have honed in on a FEW KEY FACTORS that I think make the difference between a good and a GREAT room. Obviously storage and safety are baseline…kids need a safe place to play and keep their things neat and tidy-ISH. But often -COLOR is where things can go all WONKY. I have learned that SIMPLE is best. I DO believe that a child should have some input…but when your child comes to you with four fluorescent paint swatches – YOU, the GROWN UP need to guide them and assure them that you will make sure their room is great…and then tuck those super bright colors away for accessories and finishing touches. A BIG MISTAKE PEOPLE MAKE WITH KIDS ROOMS IS TOO FILL THEM WITH TOO MUCH – TOO MUCH COLOR, TOO MUCH STUFF, TOO MUCH TO DO AND SEE AND TOUCH… JUST TOO MUCH. KEEP IT SIMPLE!!! 1. GOOD LIGHTING CAN MAKE A ROOM! LAMPS AND CHANDELIERS IN KIDS ROOMS THAT ARE NOT TOO “KIDDISH” WILL GROW WITH YOUR CHILD AND ADD STYLE AND LIGHT!! !…MY “MUST HAVES” ARE A GOOD DESK LAMP AND BEDSIDE LAMP FOR BEDTIME – STORY TIME. THE NEW TARGET PILLOWFORT LINE HAS DESK LAMPS with TOUCH ON OFF AVAILABLE IN 9 DIFFERENT COLORS! THE girls room had a great start with a sweet and feminine chandelier. 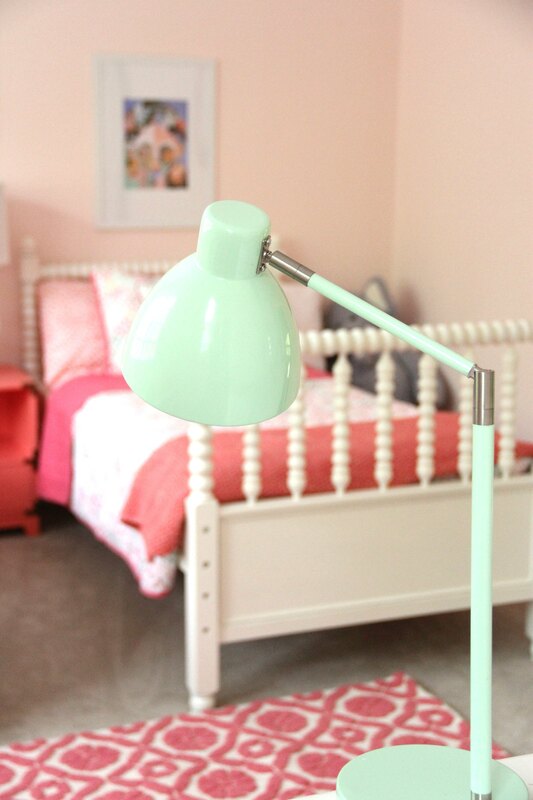 SHARED GIRLS BEDROOM IS A MIX OF light and bright PINKS AND CORALS – GREAT COMBINATION! YOU KNOW I LOVE ART. Art is the thing that makes everything make sense. 2. ART – I MAY BE PARTIAL BUT I THINK THAT NO CHILD IS TOO YOUNG TO HAVE ART IN THEIR ROOM. I like to choose special pieces that will surround them with color and design and not look too “childish” but still feel bright and happy in their rooms. Their art will greet them everyday and be a part of their childhood memories. ART is important. THERE are so many affordable ways to find ART FOR YOUR CHILD’S BEDROOM. GOLDMINE Sites like ETSY, MINTED AND EVEN NOW PINTEREST offer thousands AND THOUSANDS of beautiful new and vintage prints which can be bought framed or unframed – and many can be personalized. There are also dozens upon dozens of great ART sites, like UGALLERY , ARTFULLY WALLS, LOST ART SALON, ART.COM to name just a few which now which sell beautiful original art and prints, SO MUCH of which is great for kids rooms. 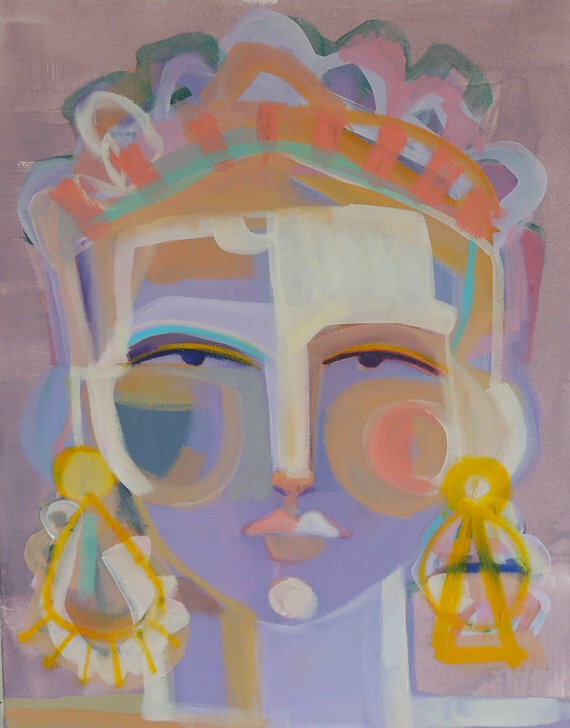 CHARLOTTE DESIGNER (AND A FRIEND OF MINE) HOLLY HOLLINGER OF THE ENGLISH ROOM BLOG first introduced me to ARTIST HAYLEY MITCHELL about a year ago. HAYLEY, also a Mom of 3 young ones brings her unique sense of style color and whimsy to her beautiful and amazing PORTRAITS and in particular her special girl portraits . SHE SELLS PRINTS OF THESE ON ETSY. I chose “MADALYN” and “AGRAGENA” for over the girls bed and framed them in simple white frames with wide white beveled mats. The utilize plexiglass not glass which is a safer choice for kids room. With Plexiglass you just need to make sure you DO NOT use windex to clean them but just warm soapy water. I love layers in my clothing and layers in bedrooms. I CANNOT GET ENOUGH LAYERS ON BEDS. PILLOWS, QUILTS, BLANKETS , AND THROWS GIVE YOUR CHILD LOTS OF COZY LAYERS TO SNUGGLE IN AND MAKE FOR GREAT PILLOW FIGHTS. I LIKE MIXING IT UP. BRINGING IN COORDINATING PATTERNS AND COLORS. FLORALS AND SOLIDS AND DIFFERENT TEXTURES and weights . 4. THE ROOM IS carpeted in a neutral, soft and durable, kid proof carpet by – SHAW FLOORS BUT I always think that A GREAT RUG CAN ANCHOR A ROOM and be the perfect finishing touch. DON’T BE AFRAID TO PUT PASTELS AND BRIGHTS TOGETHER. I OFTEN FIND THAT IN KIDS ROOMS, THE TENDENCY IS TOO PUT…. The eye does not know where to look and the feel is over stimulating. Instead – try mixing different hues of the same color…for example the pale pinks wall and a deep pink patterned rug with a coral throw. Kids grow up much too fast. And when decorating smart and on a budget – Furniture that they can grow into is a better investment. The BEDS I chose are THE “BELLAMY” BUNK BEDS by SMARTSTUFF FURNITURE. Right now the girls are too small for bunk beds but this allows for options down the road. I am a HUGE FAN of twin beds kids for sleepovers and siblings. These beds are solid and durable and will not be outgrown. For the side table I chose – THE CORAL CAMPAIGN SIDE TABLE , FROM LAND OF NOD . Combined with the SAFAVIEH REGINA lamp…they give an extra dose of awesome and elevate the look to “WOW” status!!!! 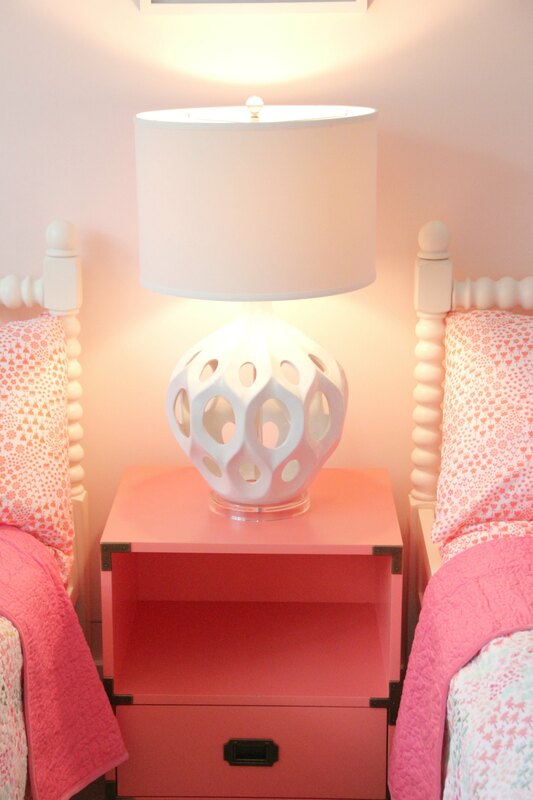 THE CORAL CAMPAIGN SIDE TABLE FROM LAND OF NOD. THE GIRLS in THEIR NEW SHARED ROOM! They look so tiny! That poster is so right. It is a girl’s world. Love the design and the color. My dream girls room! This is such a good list of tips and so spot on. I don’t have little girls but if I did, I would want them to have a room just like that!!. I love it. I just found your blog this morning and have fallen in love with your home – the colors are scrumptious. I JUST found this bedding while dillydallying through Target last week and it stopped me dead in my tracks. Sometimes I think I’m crazy – I am a 57-year old-woman and I still swoon when I see things like this, and I still long to have a “girly” room like this all to myself. Your home is beautiful and I am looking forward to going back through your blog. You are never too old or too young to find your own personal style. Mine is ever evolving. Class of ’76? Yes, indeed! You? Just wondering if your place is out near Little Washington? We used to love to wander out that way when we were stationed in DC. Love it out there! What was the name of this paint color? What was the name of the paint color? I am looking for beds for my girls… are you happy with the quality of the beds?